Armenia’s tiny Jewish community is “deeply irritated,” in the words of its leadership, with an interview in the Azerbaijani media where the Chief Rabbi of Azerbaijan’s European Jews is quoted as accusing Armenia of intolerance and praising Azerbaijan for tolerance toward its minorities. The letter, co-signed by Rimma Feller Varzhapetyan (Head of Armenia’s Jewish Community), Rabbi Gershon Meir Burshtein (Chief Rabbi of Armenia), and Villy Veiner (President of Menora Cultural Center) and published in full by PanArmenian, ridicules Azerbaijan’s Chief Rabbi Meir Bruk. Indeed the Azerbaijani Rabbi is very interesting. He is quoted as saying in the anti-Armenian newspaper that “Azerbaijan’s propaganda by an ethnic or religious minority leader [from Azerbaijan] is taken with large trust in the world” (“Пропаганда Азербайджана представителем этнической группы или духовного лидера пользуется большим доверием в мире“) crediting his own campaign about tolerance in Azerbaijan. Rabbi Bruk said in his interview to Azerbaijan’s Russian language Zerkalo newspaper on June 12, 2007 that “Armenia is weak spiritually and economically.” Not surprised with seeing regular anti-Armenian “dirt” in the Azerbaijani media, Armenia’s Jewish leaders say they still cannot remain silent on the “well-paid order” their kin is obeying. Although there is some extent of anti-Semitism in Armenia, the outcry of Armenian Jews is especially reasoned due to the outrageous intolerance of not only anything Armenian (remember the wipe out of the medieval Armenian cemetery in 2005), but the recent imprisonment and persecution of independent Azeri journalists, for example, across Azerbaijan. The desecration of Jewish graves in Azerbaijan is of course not government sponsored. So compared to how the Armenian culture has been wiped out in Azerbaijan by the state, yes, Jews live in a country of extreme tolerance. They are just a bit scared to wear the star of David in Azerbaijan says the New York Times and their leaders need to do a bit of, in the words of Rabbi Burk himself, “propaganda” to fit in the anti-Armenian society. Doesn’t Mr. Bruk know the opinion of the European Parliament on countless violations of democratic bases and human rights committed by Azerbaijan, the continuing political and judicial prosecutions of any kind of dissent? And of course God forbid Armenia and Nagorno Karabakh from goods that Mr. Bruk promises them in case if Armenia returns Nagorno Karabakh to Azerbaijan. Nobody here has forgotten Sumgait, Kirovabad, Baku, and Karabakh. People in other countries, including Israel too remember those “goods”. We think that the wise Rabbi has forgotten that his and our mission is in peacekeeping and helping our countries to settle the accumulated problems on the level of popular diplomacy, and not in compressing the complex relations between the two neighbors, which are intense and without it. Our mission is not to become marionettes in the hands of certain political and financial bosses. At the end we’d like to draw the attention of the whole European community, public and religions International Jewish Organizations that Jews of Armenia are deeply irritated at the above-mentioned article. We think that similar statements made by an official religions leader, Mr. Bruk, are of quite provocative character, they promote ethnic discord and are contrary to the tolerance policy declared by those organizations. We hope that actions of Mr. Bruk will receive adequate evaluation and condemnation. The ‘apology’ quoting America’s Ambassador to Armenia John Evans for saying he shouldn’t have referred to the Armenian genocide as such, turns out, was a fabrication by the State Department. As the U.S. ambassador to Armenia, and a career diplomat, Evans knew the uses of circumlocution. Some words, he understood, must be avoided. But then, speaking in Fresno, Los Angeles and Berkeley, Calif., two years ago, Evans violated U.S. policy by declaring that Armenians were the victims of a genocide from 1915 to 1923. When his comments became widely known, the State Department issued apologies. The statements included made-up quotes that Evans now says others crafted and attributed to him. “Let’s put it this way: I had no role in it,” he said of the statements. Pictured: Hasan Zeynalov, member of Azerbaijan’s “Sicilian” mafia who is more famous for persecuting Azerbaijani journalists and less famous for his sinister agenda in Turkey to keep the Armenian-Turkish border closed.I hope that after the murder of Turkish-Armenian editor Hrant Dink there is more appreciation for the work of journalists among Armenians. I am not sure that my optimism is applicable to the case for Armenia’s journalists yet, who are usually beaten, threatened and harassed in Armenia. Speaking of torture against journalists, I want to continue telling the underreported story of one journalist who was placed in jail yesterday, with the hope that there will be transnational outcry for persecution of journalists worldwide in general, and in Azerbaijan in particular. And not only because persecution of Azerbaijani journalists is too alarming (deaths, unbelievable high fines, regular beatings), but also because it is in the interest of everybody in the Caucasus – Armenia, Azerbaijan and the rest – to have democracy and freedom of speech. Journalists are the only ones in those isolated conflicts that can bring the rails to the truth on the table. They are the ones who can de-demonize “the other” by showing how much common all people have among each other.This is exactly why Eynulla Fatullayev was placed in jail for 2 ½ years yesterday. “Why do you interview Armenians?” This is the question that Fatullayev, in his own words, is being asked. In his “last words” (before the court decision), published at Fatullayev’s founded Russian-language Realniy Azerbaijan website, the Azerbaijani journalist ridicules the fact that in the twenty-first century people ask him why he interviews Armenians. 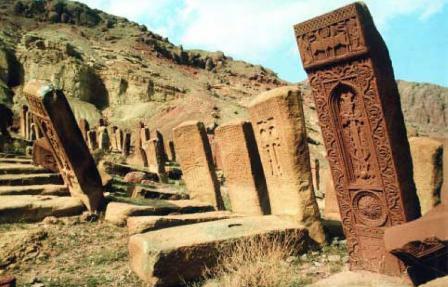 In my research about the Djulfa vandalism – the annihilation of several thousand hand-crafted medieval Armenian monuments called khachkars – I have seen pattern between persecution against journalists in Azerbaijan and destruction of Armenian monuments in Azerbaijan. It is interesting how Zeynalov himself has been apparently involved in both, but there is more to come – something hard to believe. Zeynalov is now the Azerbaijani Consul General to Kars (unless there are two Hasan Zeynalovs – which would prove my speculation wrong), where he is involved in “proving” that there is no Armenian heritage there (just like Armenians have never lived in Nakhichevan). For example, only last month Zeynalov alarmed to the Azerbaijani press that an Armenian delegation had visited Kars and “By the study of some historical sites, the delegation tries to prove the relation of these areas to Armenians. During the visit the Armenian representatives discussed the opening of the state border.” In August of 2006, the mayor of Turkey’s Kars city – across the Armenian border – was attacked by Zeynalov for having advocated for the opening of the Armenian-Turkish border. I don’t know when Zeynalov transferred to Kars, but I can’t help to speculate that his mission is to stop the border from opening (why would Azerbaijan need a representative in Kars in any way?). He is further busy organizing a commemoration for “Azerbaijani genocide” in Kars. I don’t think the line of anti-democracy and anti-“otherness” has ever been this bold in Azerbaijan before. And the bottom line is – ultranationalist Azerbaijanis are not only danger to ordinary Azerbaijanis, but to ordinary Armenians and ordinary Turks likewise and vice-versa. Editorial note: The entry below is an original article written by a Blogian reader who would like to remain ananymous. Readers can submit their original (unpublished in other places) work to [email protected] for consideration. Complaining about international film depictions of the Armenian Genocide, Turkish Prime Minister Erdogan’s foreign policy advisor supports a new international film about Turkish benevolence towards Jews during the Nazi era. Oddly enough, the Turkish-American production company is best known for a 2006 domestic hit film which was widely criticized as anti-Semitic. The Turkish Daily News reports that BMH Worldwide Entertainment is filming The Ambassador, about a Turkish diplomat who saved Jewish lives during World War II. BMH’s 2006 film, The Valley of the Wolves: Iraq, wildly successful in Turkey, was heavily criticized in Turkey, Germany, and Israel as racist and anti-Semitic. Gary Busey co-stars as a Jewish U.S. military doctor who cuts out the organs of Iraqi prisoners at Abu Ghraib and sells them to wealthy clients in New York, London, and Tel Aviv. There is no sympathetic Jewish character to balance out this portrayal, reports the Jerusalem Post. The initials BMH stand for the company’s co-founders: Los Angeles sports promoter Bjorn Rebney; Chicago financier, Assembly of Turkish American Associations former Midwest VP and past president of the Turkish American Cultural Alliance Mehmet Çelebi; and Chicago PR/marketing executive Hüma Alpaytaç Gruaz, who is reportedly married to Rebney. Based in Los Angeles and Chicago, BMH shares a fax number with the Alpaytac PR/marketing firm, which promotes the Chicago Turkish Festival. Alpaytac’s clients include the Turkish American Cultural Alliance and the Turkish Consulate. BMH Worldwide Entertainment has been working with Member of Turkish Parliament and previous President of the Federation of Turkish-American Associations Egemen Bagis, who has spent many years in the United States and is very aware of and concerned about Turkey’s image around the world. He has been a great supporter of this and other projects that will enhance Turkey’s image across the globe. Prominent figures of the diaspora pay Hollywood to make genocide movies. We too have wealthy people; however, we don’t have a culture of investing in Hollywood. We should also be relying on such methods and commission movies explaining Turkey’s side of the story. Two sides to the story? Sure. Racism and anti-Semitism for domestic consumption, tolerance and harmony abroad. Satellite Armenia: Military or Cultural Security? We have a unique opportunity to document the Armenian culture and material history before it is completely wiped out in Turkey and in Azerbaijan. This would cost about 1 million dollars, but I highly hope rich Armenian foundations will realize the importance of such a project. In terms of fully satellizing the destruction of the Djulfa cemetery, it would only require about $3,000. Although having access to American satellites, NATO member Turkey has decided to lunch an 80-centimeter-resolution satellite into the orbit by 2011. According to The Space Review (“Turkey’s military satellite program: a model for emerging regional powers”), “Space-based observation is one important way that they can keep track of activities in places like Armenia” and other places. In fact it was due to the genocide that Turkey committed against Armenia and the crime’s acknowledgement by the French government that delayed the process of satellitizing Turkey’s military espionage in the region. Back in 2001, “The Turkish Defense Ministry canceled a contract to purchase a US$259 million high-resolution Earth observation satellite from Alcatel Space in retaliation for the French parliament’s vote to condemn the Turkish killings of Armenians in the early 1900s.” An Israeli corporation, according to Space and Tech, was supposed to benefit from the Turkish angriness, but it remains a question why Turkey still wants to lunch its own satellite. Why Israel? According to the report, the Jewish state doesn’t mind doing business on spy satellites: ”Israel seems to be willing to sell spy satellites to other countries. Reports about negotiations with Singapore have appeared in the Singapore and Malaysian press.” Why not Turkey then? The government-owned Turksat already has several broadcast satellites for promoting “cultural, economic, and political influence” from Turkey to Central Asia – the area that many Turkish nationalists have hoped to unite in a Pan-Turkish empire. But Turkey has already started documenting its neighbors. It “is already buying imagery from commercial sources” – that are available to everyone for the same price. The report about Turkey’s satellite ambitions came three weeks after I purchased a 2003 satellite image of Nakhichevan’s (part of the Republic of Azerbaijan) Julfa’s (Culfa, Jugha) region’s western portion – that shows the ancient Armenian cemetery (now destroyed), the village Gulustan, several other monuments such as caravanserais, churches, and a historic Mulsim tomb. I purchased the image from Digital Globe. Since then I have been wondering whether the Armenian government owns this available-to-everyone satellite images of the region. It would cost Armenia about 1 million dollars to get Digital Globe’s entire coverage of the Armenian Republic and the Republics of Azerbaijan and Turkey, at least the immediate bordering areas. 1. The cemetery was over 70% intact in September of 2003, even after the deliberate acts of official vandalisms in 1998 and 2002 that UNESCO had ordered to stop. 2. The 1998 and 2002 vandalisms were done by heavy technology – the entire level of the soil was scrapped off. The darker side is the most recent and the deepest scrap. This could not have been done by a group of hooligans. This was not done in a search for treasure. 3. The scrapped trace proves the intent of totally wiping out the cemetery even before 2005. A very thick level of the soil had been removed. Hundreds of skeletons must have been exhumed in this process and destroyed. 4. 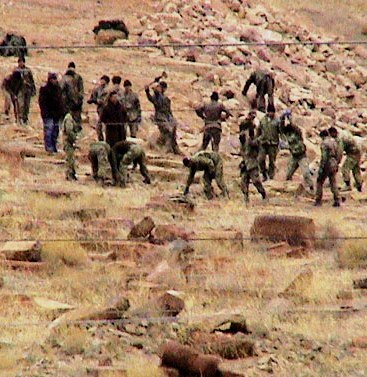 Although it is not too clear – but if it is zoomed in and studied closely it can be noticed that most, if not all, headstones (khachkars) were pushed down to the ground and none were standing in Sept. of 2003. This may have been done either in 1998 or 2003, as a first step of destroying the headstones. In fact, if you compare a December 2005 photograph with the Sept 2003 satellite image you will notice that in both places the khachkars were laying down on the ground instead of standing in their regular positions. I do have many other images of the surrounding area, but would like to keep them for sharing on possible future presentations about the vandalism. All the images are from the big file that I got from Digital Globe. The negative aspects of Digital Globe satellite imagery are that these areas are taken on different dates and times. Thus, “coverage” of the region could have been from 2002-2006, and many things might have changed in the meantime. Another problem would be getting detailed imagery. Digital Globe does not provide 80-cm imagery, as the one that Turkey aspires. But even so, the satellite images will provide much information. In fact, Azerbaijan is aware of what I am talking about. When this hostile neighbor accused Armenia of deliberately “burning forests,” they immediately provided several satellite images of the area with different dates of download (these images are available here). How did Azerbaijan get this imagery (that didn’t really “prove” anything other than that the forests were really destroyed due to a fire)? Digital Globe, as far as I know, would not have been able to provide information that fast. In fact, it takes them up to 60 days to download a current image of an area. So, Azerbaijan either used U.S. technology with the help of its ally and NATO-member Turkey, or has another secret access to satellite imagery, OR, there is another simple access to such images that Armenia is not even aware of. The images say “Space image,” but my Google search did not provide such a copyright holder. I doubt that Azerbaijan has its own satellite in the orbit, but I wouldn’t be surprised if it had one very soon. I have discussed it earlier that there is no reason that Armenia would have burnt forests. But an Azerbaijani blog says that the fire was deliberately done “perhaps in an attempt [to] clear land mines at the perimeter of the disputed area.” This wouldn’t make sense either, because there are no people living in these areas, and, as far as I understand, Armenia is planning to give up the particular territory to the Azerbaijanis in the future peace deal. Nor does Nagorno Karabakh President’s assertion – that Azerbaijanis have shot fire starting balls to the forests to blame the Armenians – make sense. Again, I don’t think any side would have deliberately started destruction of forests – although both Armenian and Azerbaijani governments are infamous for environmental degradation in their countries. Though, wait a minute, I may have double thoughts about Azerbaijan on this… I mean, it would be totally “worth” to cause forests fire in Karabakh to blame on Armenia in Azeri officials’ eyes, to balance the pressure on Azerbaijan for destroying the Djulfa cemetery. But, no, I don’t think they are that sick. What if ones of those mines blew up and started the fire? In any case, I think had the conflict was solved earlier the forest fire would have not been so widened in the area. Now let’s get back to satellite wars. I wonder whether the Armenian government knows that satellite images can be purchased. By didn’t the foreign ministry purchase satellite images of the Djulfa cemetery before and after the destruction? As I already mentioned, I purchased the before image for “The New Tears of Araxes,” but I haven’t found a sponsor to help purchase a current satellite image that would cost between $1,200 and $2,000. It would cost only $1,500 years to have a final documentation of the vandalism, but interested parties are either not genuinely interested or don’t know they can do this. After all, sometimes satellite images are not helpful at all. Look at the satellite image of Iran’s Embassy in Armenia. Would you be able to figure out from this that a small Armenian Nazi group (the “Armenian Aryans”) gets financial support from this building? In fact, not really having much hope for the current Armenian government, I hope an Armenian organization (a library, museum, etc.) in America will find ways to document historic Armenia in satellites (and then perhaps share the info with the Armenian government). We have a unique opportunity to document the Armenian culture and material history before it is completely wiped out in Turkey and in Azerbaijan. This would cost about 1 million dollars, but I highly hope rich Armenian foundations will realize the importance of such a project. But first we need people who would be interested to communicating and organizing all these. An Armenian Research Center at a U.S. university sounds the best option here. One non-Armenian university professor, according to the CNN, has already purchased many photos of Mount Ararat with the ambition to find Noah’s ark. Finding Noah’s ark would not be the next cool thing after documenting the Armenian monuments. The non-Armenian monuments of historic Armenia should also be documented. If Armenia ever ends up liberating more historic lands, these monuments must be preserved, and we need to document them today so that we take care of them tomorrow. I don’t want the non-ingenious people of historic Armenia (the Turkic-Mongoloid peoples) die and disappear, but history shows that, in the long-run, Armenians end up staying in their homeland, while the newcomers continue their journey. More realistically, this (80 million Turks leaving the region) will not happen, but future liberation of Nakhichevan – the region that Stalin gave to Azerbaijan and the region where the Djulfa cemetery was wiped out along with thousands of other ancient Armenian monuments – is realistic, so even though all of the Armenian culture has been wiped out there, we should document the Muslim culture to preserve it in the future. Speaking of preserving culture, let’s talk about our own. A Blogian reader from the Czech Republic has visited Armenia lately and got shocked after seeing the treatment of the Armenian monuments in Armenia. He sent us a photo of a tonir (the well where the traditional Armenian bread – lavash – is made) from one of Armenia’s most ancient monasteries – Khor Virap, where Grigor Lusavorish (Krikor the Illuminator) was imprisoned for many years before he converted Armenia to Christianity in 301 A.D. The tonir in the sacred site has been used by a garbage bin by visitors. A local Armenian would blame the government – or whoever is in charge of taking care the historic monastery – for not putting trashcans in the area. But I think it also has to do with the visitors. For one reason, I can almost swear that no Diasporan Armenian would have thrown trash into the tonir. Has to do a lot with “dastiarakutyun” (the English term doesn’t come to mind); has to do a lot how people are taught about this world. There is lots of chances that even if the monastery was overpacked by trashcans people would still throw garbage into the tonir. I visited Mother Cabrini’s shrine in Colorado last year. The sacred Catholic site had a sacred water fountain where people say water was found by God’s guidance. There were free plastic cups to drink the water and, as you can imagine, dozens of trashcans all over the place. When I tried to put a small donation in the huge can next to the water fountain, I saw used plastic cups smashed in it that blocked from putting the money in. Why would they do that? Well, perhaps they did not understand the “donation” sign, because most people who go there are Hispanics and perhaps don’t speak English. But hey, what has happened to the thing called common sense? I guess the mere presence of trashcans is not the final and complete solution. Well, let’s blame the absence of trashcans for the tonirtrash in Khor Virap, but what about the graffiti on the same monastery done by Armenians? Oh, these are done by unholy communists who hated the Armenian Church. Well, what about the 2005 Alphabet statues? Why is there graffiti on them too?